An introductory class for beginners or those wanting information on the Craft focusing on the spiritual aspects of who we are, what we do and believe. Lady Morrigu has been a Craft Practitioner for over two decades in the Atlanta area. She is a member and teacher of the Ravenwood Tradition. We will explore crystals that help to keep the Mind, Body, and Spirit balanced on a day to day basis. Traditional World Dance moves used by common people (not trained dance performers) you can use in your everyday spiritual practice, group energy raising, and for performance. InterPlay is based in a series of incremental forms using movement, spoken word, and music that allow participants to express themselves and have fun. It’s a practice that affirms the good in people and encourages all ages to enjoy relaxing play and connections with people. Above all, InterPlay is fun! There’s no right or wrong way to do InterPlay, so you can’t do it wrong. I’m a certified InterPlay leader from Byron, GA, who has been teaching InterPlay for about 5 years. I’m a member of Berkano Hearth Union, which is an inclusive, diverse Heathen group in the Atlanta area. I do computer stuff to pay the bills. I’m a mom to three grown kids and two naughty cats. Recipes for Healing based on Hearth Craft. This class talks about the different herb properties both magicakal and mundane. We will be discussing the best herbs for digestion for upset stomachs, anxiety calming teas, and many other things. Come with a note book to write down recipes and come have some fun learning about Hearth Craft and Kitchen Witchery. Gardening for beginners with a focus on edible and medicinal herbs and a Q&A session for all skill levels. Amy Payson has an AAS in Horticulture, she is Georgia Certified Plant Professional, and she has 6 years of experience in personal gardening, landscaping, and the green industry. If you have never used Reversed cards in reading Tarot, you’ll get a few ideas about when you should (we’ll even cover a few ideas about when you shouldn’t). If you are already using Reversed cards in readings, we’ll give you a few new ways to interpret them. Open the doors on a whole new dimension of interacting with the cards we know and love. Karen is a Tarot reader and teacher with 35 years of experience. Familiar to the ATL Craft community, she offers private readings and presents lectures on a wide range of Tarot topics. 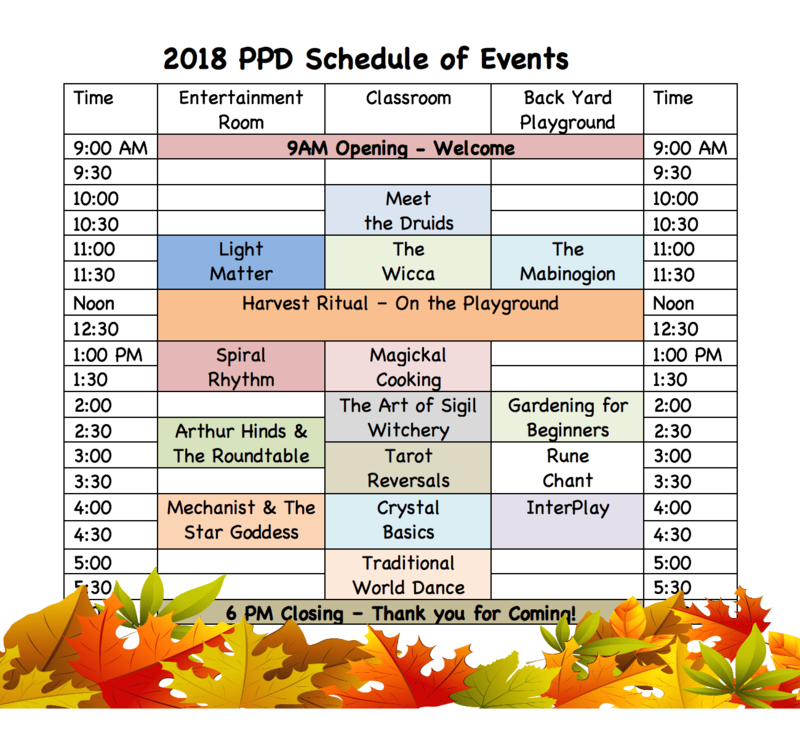 Whether you have been to a ritual before, or not, all are welcome to this open Harvest Ritual! RUNEDOG ART’s Timothy H. Patton, author of “The Language of Secrets, Interpreting the Runes of the Elder Futhark in Verse” will offer a brief discussion of the history of runes and their applications for the modern practitioner. Timothy will then lead an audience-participation rune chant, as an example of how contemporary pagans can “Send” runic energy with the collective will of a group.